Jews have participated in Virginia's social and economic life from the colony's beginnings. 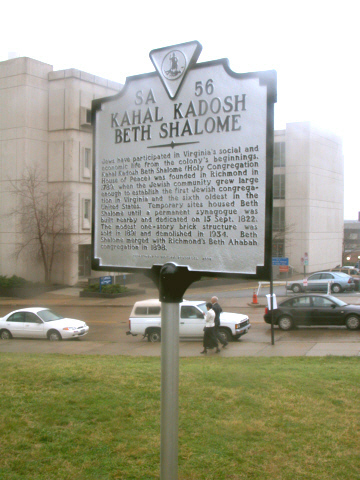 Kahal Kadosh Beth Shalome ( Holy Congregation - House of Peace) was founded in Richmond in 1789, when the Jewish community grew large enough to establish the first Jewish congregation in Virginia and the sixth oldest in the United States. Temporary sites housed Beth Shalome until a permanent synagogue was built nearby and dedicated 15 September, 1822. The modest one story brick structure was sold in 1891 and demolished in 1934. 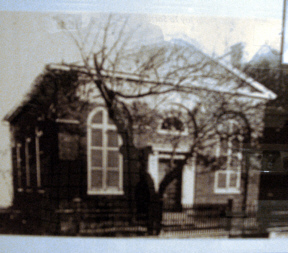 Beth Shalome merged with Richmond's Beth Ahabah congregation in 1898. Beth Shalome was organized in 1789. The building, 1822, was a small brick structure on Mayo Street near the present site of the marker at 14th & Franklin on the grounds of the James Madison building. 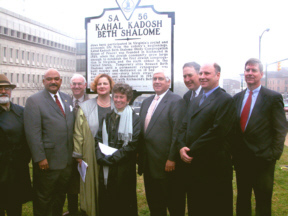 The community was small and eventually merged with Congregation Beth Ahabah of Richmond making Beth Ahabah, the oldest, permanent Jewish House of Worship in the State of Virginia.